I know it is hard to believe because I love ice cream so much, but I LOVE kale chips! Real talk, I love making them at home. I haven't tasted a store bought kale chip that I like very much. Which is just fine because making them at home is so easy and quite fun. 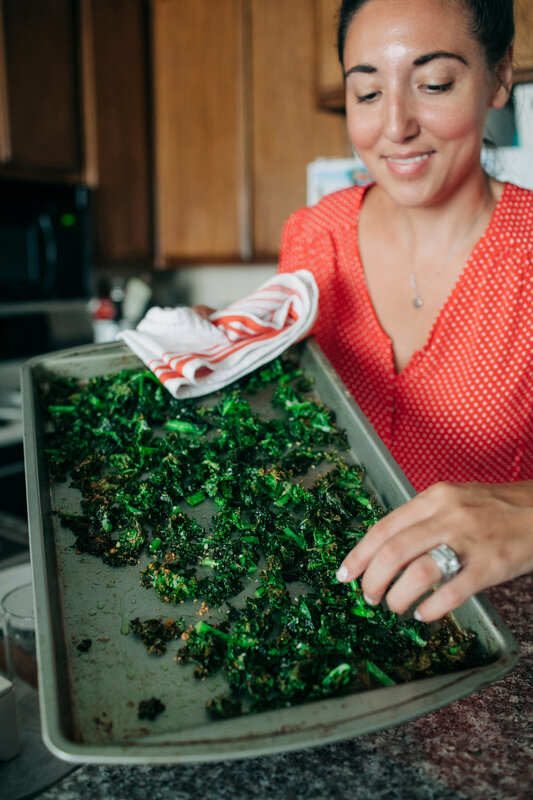 Making kale chips takes less than 30 minutes. I also love that you can customize the flavor any way you'd like. My go-to flavor pairing is garlic and parmesan. Though you can try and add shredded cheese or just do salt and pepper. Try using seasoned salt or any other spice you like best. When you bake kale something really incredible happens. The leaves get toasted and real crisp, much like a chip. I don't have to explain that kale is healthier than regular corn or potato chips. I mean, chips are great! But swapping chips for kale chips every now and then is more better than not. Give my little how-to a try and let me know what you think! Try making a batch for an after school snack for your little ones. Get them into the mix so they will be more inclined to eat the final product. Or if your kids just won't go for them, make a batch for yourself! What You Need; 1 bag of kale or a bunch of kale (both can be found in the produce section. I like getting the kale in a bag because it is already cut into bite sized pieces for me. If you buy the bunch of kale, rip the kale leaves from the stem and then chop the leaves into bit sized pieces), 4-5 tablespoons of olive oil, 1/3 tsp sea salt, 1 tsp black pepper, 2 large cloves of peeled garlic, 2 tablespoons of grated parmesan cheese, large baking sheet. What You Do; The first thing I like to do is pour your olive oil into a small bowl. Peel your garlic cloves. I like to use this garlic peeler because it is so easy! I also cook with fresh garlic, it is one of my favorite ingredients. Now, grate your garlic into the olive oil. I like to grate my garlic because it makes for a good coating on the kale. Grating the garlic helps get tiny bits of garlic in every bite. You can use a microplane like I have here or the smaller side on a cheese grater. If you don't have either of those, then just chop your garlic very very fine. Next add in your salt and pepper. You don't need much salt here because the parmesan cheese is salty. Stir it all together. Next rinse your kale and dry it really well. You don't want any water on your kale or else it will be hard for the kale to crisp up in the oven. Use a kitchen towel to dry your kale leaves. Drizzle your seasoned olive oil all over the kale and use your hands to work it in real well. 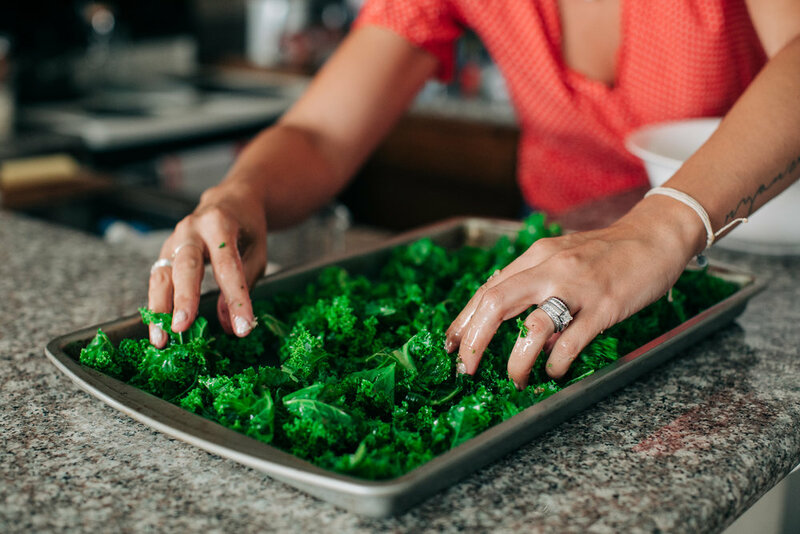 Evenly spread your coated kale onto a baking sheet. Lastly, sprinkle your parmesan cheese all over your kale. Bake at 350 degrees for about 15 minutes or until toasted and crisp. Enjoy! Store in an air tight container or zip top bag for up to 3 days.